1. Two precision drivers provide dual-channels stereo. The max sound output can be up to 20 watts, which is very loud. 2. Built-in enhanced sound unit ensures the sound crystal clear. The damper of the sound unit and low-frequency radiator provide rich powerful bass. 3. In TWS mode, any two Zoweetek speakers (ZW-BSP04) will be combined as one wireless bluetooth speaker system. Then two speakers receive audio from same audio source device via bluetooth. And the two speakers can deliver total 40 watts dual-channels stereo sound. 4. 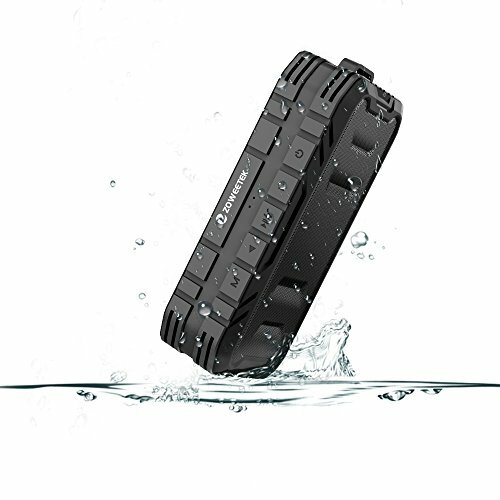 Rugged smooth rubber shell and built-in baffle provide shockproof, dust-proof and IPX5 waterproof protection. This outdoor portable bluetooth speaker won't be damaged by water splash, rain, dust and impact. There is a 'D' ring on this speaker side and you can use the hand rope to take it to anywhere. 5. Built in 3600mAh rechargeable high capacity battery, this speaker has 12~36 hours playtime depending on the volume. You can use USB cable to charge it. 6. Supports bluetooth playing, 3.5mm AUX audio input, TF card playing and USB sound card playing (connect via USB cable). Supports volume control, switch songs, pause and play. 7. In bluetooth mode, the wireless connection distance between speaker and audio source device can be up to 10 meters (33ft). In TWS mode, the wireless connection distance between two speakers is within 1.5 meters (5ft). 8. This speaker can read and write TF card via USB cable. The built-in HD mic supports hands-free calling. You can active the SOS function to produce very loud alarm sound to ask for help when you are in danger. 【 Clear and loud sound 】 Dual drivers and low-frequency radiator provide crystal clear stereo sound and rich powerful bass. No distortion, no noise and no delay. The loudest sound can be up to 20 watts (Dual 10 watts). The indoor coverage radius of the loudest sound is 20~40 meters (660~1320 ft), and the outdoor coverage radius of the loudest sound is 10~20 meters (330~660 ft). 【 Real and rich stereo 】 In Bluetooth mode, TWS (True Wireless Stereo) function can pair any two Zoweetek speakers (ZW-BSP04) via Bluetooth, then dual-channels stereo audio can be played in sync on both speakers. One speaker plays left-channel sound and another one plays right-channel sound. In TWS mode, two speakers can even provide total 40 watts super big sound. 【 Robust protection 】 The solid and compact design is shockproof, dust-proof and IPX5 waterproof. Water splash, rain, dust and impact won't effect this speaker. Equipped with a hand rope, this speaker is portable. You can take it to beach, pool, forest and etc..
【 Quick connect and play 】 Stable wireless bluetooth connection distance can be up to 10 meters (33 ft). Supports bluetooth playing, 3.5mm AUX input, USB sound card playing (Connect via USB cable) and TF card playing. 【 Long duration battery 】 Built in 3600mAh rechargeable battery. Charged by USB. Playing music time can be up to 24 hours at middle volume. Supports directly reading and writing TF card via USB cable connection. Built-in HD noise-reducing microphone supports hands-free calling. When you meet danger outdoors, you can use the SOS alarm function to ask for help. Portable Outdoor Bluetooth Speakers 20W Retro Wooden Bluetooth Home Speaker with Double Sterco, Mobile Speaker Support TF Card and Aux Playback.